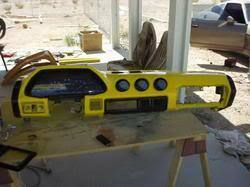 Wiki Home \ HOW TO: MAKE A FIBERGLASS DASH. 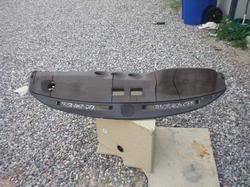 HOW TO: MAKE A FIBERGLASS DASH. HOW TO MAKE A FIBERGLASS DASH. I AM GOING TO EXPLAIN HOW THIS IS DONE BUT THIS WILL TAKE TIME , A LIL MORE THAN $75 , AND SOME GOOD HARD WORK. WITH THAT SAID I WILL BEGIN W/ THE MATERIALS LIST. ****A DREMMEL TOOL W/ ASSORTED HEADS A DEFINITE MUST! AFTER IT HAS HARDENED , AND YOU START TO SAND IT, THE FIBERGLASS DUST CAN GET ITCHY IF IT GETS ON YOUR SKIN, WEAR A FULL SLEEVE SHIRT AND A WHITE PAINTERS MASK. YOU MUST MIX IN THE HARDENER SOLUTION IN W/ THE BASIC RESIN ( SOLUTION COMES W/ THE CAN)OR THE FIBERGLASS WILL NOT HARDEN!!! DON'T BE AFRAID TO USE A LOT! SAND OR DREMMEL TILL YOU GET THE SHAPE YOU DESIRE. BE CAREFUL NOT TO SAND TO FAR , OR ELSE YOU WILL SAND INTO THE DASH SAME THING GOES FOR THE DREMMEL TOOL! AND WITH THAT SAID LETS GET STARTED FOR REAL NOW! THIS IS THE DASH STRAIGHT OUT OF THE CAR ! MAKE SURE YOU ARE CAREFUL WHEN REMOVING IT AND UNHOOK ALL WIRING.. MIX UP SOME FIBERGLASS W/ THE HARDENER IN A BOWL AND DIP YOUR BRUSH IN AND START APPLYING IT OVER THE BARE DASH. OR ,IF YOUR DASH IS IN PERFECT CONDITION JUST LAY THE FIBERGLASS MAT OVER THE DASH. THEN SECURE THE FLEECE TO THE DASH WITH GLUE OR USE A STAPLE GUN BUT MAKE SURE TO STAPLE ON THE INSIDE OF THE DASH SO YOU DON'T HURT THE OUTER AREA. 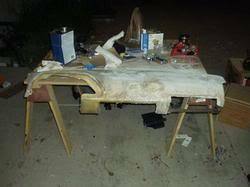 THEN APPLY SEVERAL COATS OF THE FIBERGLASS / HARDENER MIXTURE ( LIKE 3 -5 DEPENDING ON HOW THICK YOU WANT THE DASH),( WHERE THERE IS FIBERGLASS THERE IS FLEECE UNDERNEATH THAT AREA) THIS IS WHAT IT SHOULD LOOK LIKE AFTER IT HAS DRIED! NOW YOU WANT SAND DOWN THE DASH UNTIL IT IS SMOOTH ON SOME AREAS IT IS BETTER TO SAND BY HAND !! LIKE FOR EXAMPLE THE CURVES OF THE DASH. AFTER YOU FINISH THAT YOU WANT TO CUT / DREMMEL TOOL OUT THE HOLES OF WHERE ALL THE DASH'S GAUGES AND SWITCHES GO , THE YELLOW ARROWS POINT OUT WHICH AREAS NEED TO BE CUT / DREMMEL TOOLED OUT AND THE SPRAY-CANED AREAS NEED TO BE SANDED CAREFULLY! NOW USE PRIMER AND PAINT THE DASH, DOING SO WILL HELP YOU NOTICE AREAS THAT STILL NEED SANDING ATTENTION. AFTER EVERYTHING IS NICE AND SMOOTH SPRAY PRIMER ONE MORE TIME , AND THEN SPRAY 3 - 7 COATS OF THE DESIRED COLOR ON THE DASH. THEN WAIT ABOUT 4 HOURS ( BELIEVE ME YOU COULD LEAVE FINGERPRINTS OR A BIG SMUDGE IN THE DASH IF YOU TRY TO INSTALL IT WITHOUT LETTING IT DRY FOR THE 4 HOURS. THEN CLEAR-COAT THE HELL OUT OF IT THE MORE YOU USE , THE SHINIER IT GETS. I DID ABOUT 4 COATS OF THE CLEAR COAT. THEN INSTALL THE DASH BACK ON THE FRAME AND PUT ALL THE GAUGES / SWITCHES IN AND INSTALL!!!! THE DASH FINALLY PAINTED AND CLEAR COATED! DAMN ITS SHINY! DISCLAIMER:: I HAVE TRIED MY VERY BEST IN DESCRIBING THIS PROCESS SO THAT OTHERS CAN HAVE A NICE NON-CRACKED DASH ALSO. IVE ALSO LET YOU KNOW THINGS FROM MY EXPERIENCE THAT I THOUGHT WOULD HELP YOU OUT SO YOU WOULD MAKE NONE OR VERY LITTLE MISTAKES. BUT , I AM IN NO WAY RESPONSIBLE FOR ANYTHING THAT MAY HAPPEN DURING THIS PROCESS. like rog said,great job!thanks for taking your time and posting this! Very nice write up dezionz - covered a lot of those pesky details that help make an ok project a great project. I pretty much did the same thing to my dash except I stapled the fleece EVERYWHERE! Found out the hard way that Bondo products don't really stick well to the plastic that makes up a Mazda dash. It seems that the plastic Mazda uses is closer to the material that your plastic Bondo spatulas are made out of. Anyway, plastic adheasion promoter helps a lot in getting things to stick to the Mazda plastic (primer/fiberglass resin/bondo/etc.). 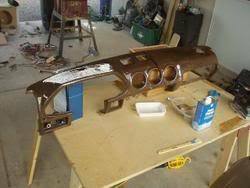 The link below has some pictures of my dash project starting on Page 19. As this is a Tech Writeup I figured the more info available the better. Very nice write up. Thanks for taking the time, it will help others out for sure. I take it that it would be a similar or the same process when using a bare MDF board? Someone also recommended polyester knit for when doing areas involving speakers. Would fleece be good for any dash component around speakers as well or is it not as acoustically transparent? i have used MDF board,fleece,polyester knit, and 100% cotton knit they all work and the spray-on starch makes it stay where you form it to be till you get the resin layed up on it. as far as it being transparent. the glass and resin ain't clear when they setup and dry. but most things will be painted so it shouldn't make a diff.